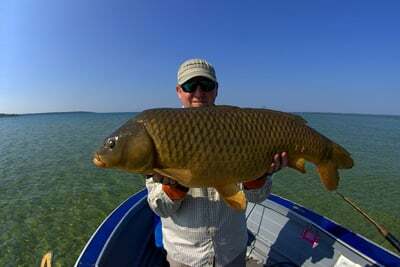 By now most fly anglers have heard about the fantastic flats-style carp fishing found in northern Lake Michigan. If carp are not your cup of tea, read no further, but if you’re a carp enthusiast willing to travel, Michigan may well be your ultimate destination. Carp fishing is often referred to as brown-lining. But fishing the Lake Michigan flats is nothing like this. It is indeed more akin to fishing saltwater than fresh—the water is shallow, crystal clear, and blindingly blue, and you’re casting to pods of large fish that can number into the hundreds. Many of the fish easily top thirty pounds and it’s not uncommon to see fish well over fifty. As in saltwater fishing you’re surrounded by the sounds of wind and surf and the chatter of diving gulls and terns. Nothing beats the thrill of a pod of large fish approaching, of trying to place your fly in just the right zone, of seeing a fish stop, follow and engulf your fly. In such shallow water the hook-up is often explosive, with drag-searing runs that can take you well into your backing. 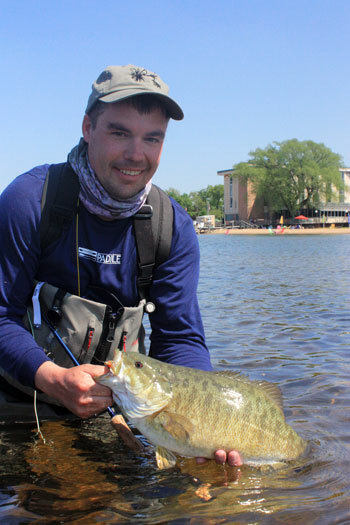 Numerous bonus smallmouth bass help make this some of the most exciting fishing anywhere. While there are flats scattered around the Great Lakes, there are three areas in Lake Michigan that form a triumvirate of flats fishing, each with its own appeal. They are Grand Traverse Bay—with Traverse City as its hub, Beaver Island, and Wilderness State Park outside of Mackinaw City. Grand Traverse Bay is perhaps the first area where this type of fishing really took off, pioneered by the likes of Jeff “Bear” Andrews. It features many miles of shallow flats on this north-south-running bay that extends for 32 miles and is divided into East Bay and West Bay by Mission Peninsula. Traverse City is the perfect family vacation destination for the carp angler who wants to sneak in a couple of days of fishing. It offers everything from rustic camping to beach front hotels, to high-rise golf course luxury. There are miles of white sand beaches and plenty of public access, the countryside has dozens of wineries, and Traverse City has a lively local dining scene, as well as shopping and other amenities. In other words you can go out and fish relatively guilt-free, knowing the family has plenty to keep them busy. The carp fishing is fantastic, and if they are challenging the smallmouth usually save the day. Be sure to stop in at The Northern Angler fly shop for flies and the latest information and directions to access, or you can book a guided outing with them. Due to heavy boat traffic and warming water in this premiere tourist destination, the flats fishing here usually tapers off rapidly around July 4. Beaver Island has gotten a lot of press in the last year, having been featured by Kirk Deeter and Tim Romano in Field and Stream last year, and this year by Cameron Mortenson of The Fiberglass Manifesto and Dave Hosler of Pile Cast among others. Is it really worth all the hype? You bet. I flew over on Island Airways on the invitation of Ethan Smith of SmithFly to fish with Steve Martinez of Indigo Guide Service. Beaver Island has public access and shore fishing opportunities, but your best bet is to hire a guide, and the only ones currently operating here are Steve Martinez and Kevin Morlock of Indigo Guide service. 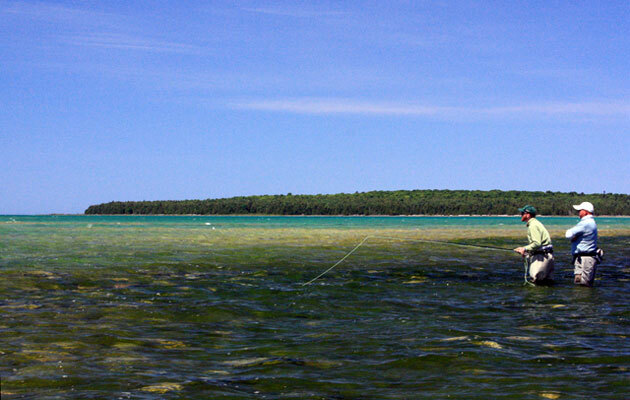 Some of the best fishing is to be found on the numerous offshore islands and reefs surrounding Beaver Island, accessible only by boat. Beaver Island is more than twenty miles from the mainland across treacherous waters that can breed sudden storms, so unless you’re willing to pay the ferry to cart your boat over there, Indigo is the best option. Kevin Morlock pioneered the carp fishing here and he and Steve know these islands and the often-tricky navigation. The fishing is dictated by wind direction, with the fish moving in on windward flats, and predicting where the fish will be on any given day isn’t as easy as it sounds. Beaver Island has a definite laid-back island vibe. The locals are very quick to let you know “this ain’t the mainland.” Its small local population largely caters to the tourists and cottagers who come each summer, and so there are several excellent dining options and lodging that ranges from waterfront hotel to bed and breakfast. Cellphone and internet service are spotty at best, so if you’re looking for guided fishing with a laidback ends-of-the-earth flavor, this is your destination. Beaver is home to some of the biggest carp in the lake, and several around the forty-pound mark have been landed this year. The fishing here lasts well into August. Wilderness sits on the far northwest corner of lower Michigan, about ten miles outside of Mackinaw City. This is the do-it-yourself destination. The flats fishing is largely on the south side of Waugoshaunce Point, all the way out down the gravel road that winds through the far reaches of the park. Where Grand Traverse Bay has an almost genteel aura with its shoreline cottages, bike trails, vineyards and orchards, Wilderness feels desolate and lonely. It has long been famous for its large population of smallmouth and is increasingly known for its carp fishing. It’s not uncommon to cast to schools of hundreds of fish and be the only person in sight. While the shoreline is only about six miles long, it has numerous back bays and inlets shielded by barrier islands, with flats that are in the hundreds of acres. The further out you go, the less people and more fish you’ll see. While the park has numerous campsites in various locations, it also has several secluded beachfront cabins that sleep several people each. You’ll want to book these at least six months in advance. The fishing can last well into August but peaks at the end of June and beginning of July. For information, flies, gear and guides, contact the following.